Despite the advancement of multimedia formats, nothing can beat plain old text. This means that, save for a handful of graphic design jobs, most of the time in the office is still probably spent on typing large volumes of text. 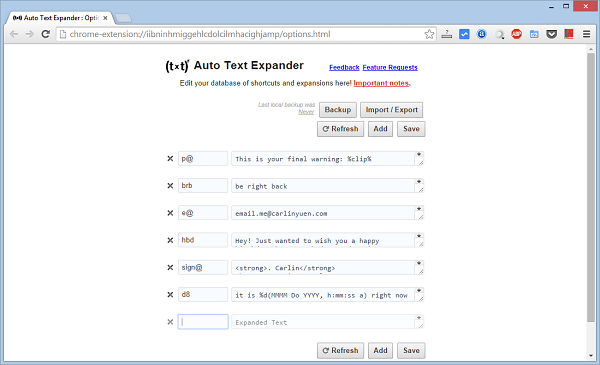 This is where text expanders come in handy, since they allow you to assign shortcuts and macros to text actions, which will save you time on typing emails, documents, and texting. 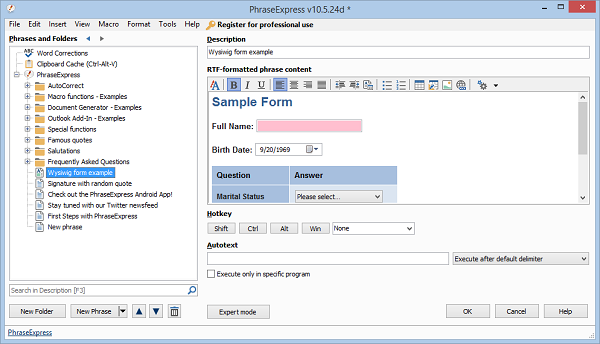 PhraseExpress has three main functions: Word Corrections, Clipboard Cache and Local File. Each of these can be configured and hotkeyed independently. 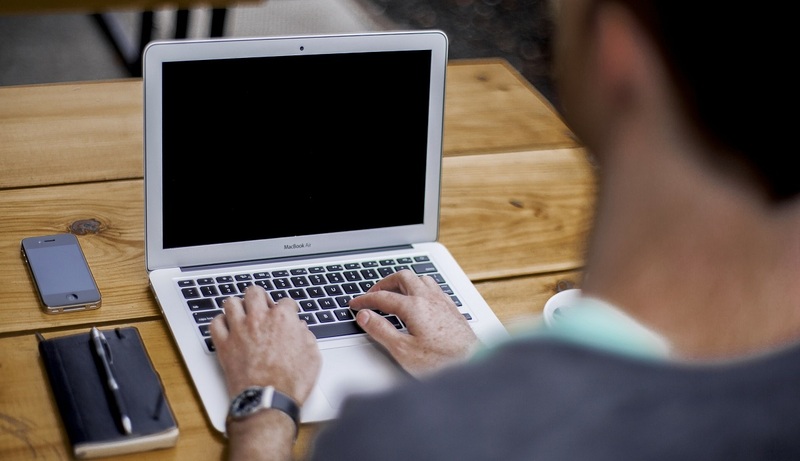 Word Corrections requires a dictionary to be downloaded separately for free, available in English, French, German, Dutch, Italian and Portuguese. By default, Clipboard Cache is activated by pressing CTRL+ALT+V and remembers up to 20 separate text entries you copied, but this can be easily changed to virtually unlimited. Local File is the main function of the program and replaces the text noted in the “Autotext” box with whatever is in the “Phrase content” box. PhraseExpress is also available as a portable application, it can check a Dropbox-synced folder for a phrase file or use the one hosted on a server. Overall, it is enterprise-ready from the moment its installation completes. 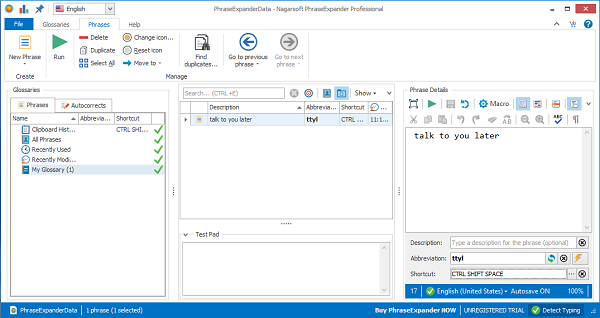 Upon its first launch, PhraseExpander will show you a tutorial that walks you through its main purpose – the creation of shorthands and phrases that replace them. This tutorial is a really good feature which makes it a breeze to get started with expanding phrases. When you type an abbreviation, a popup context menu will appear, giving you an option between variations of the phrase. You can navigate this menu with ↑ and ↓ arrow keys and press SHIFT to insert the phrase. As you type in various applications, PhraseExpander will note where you use which phrase and sort them accordingly, notifying you with a popup from the system tray. This is a very good program, fit for professional use and by visiting its homepage you might even get to have a live chat with the author, Andrea Nagar. 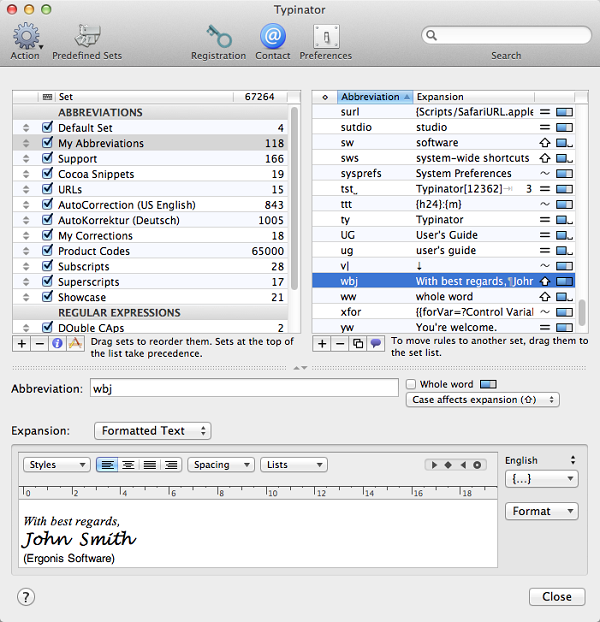 Since TextExpander is optimized for use on Mac, it has a seamless, system-wide integration of its functions on any Apple device. The phrases are called “Snippets” and can be formatted in a full range of options, including graphics and hyperlinks. This means that you can create a custom signature with links to your social network profiles or websites and a .png picture of your signature with just a few letters. “Fill-in snippet” functionality gives you the option of creating templates with blank fields that you can then fill in with appropriate information, which is excellent for creating generic e-mail replies. Typinator resides in your menu bar and has a neat interface where you can add abbreviations by clicking the + button. 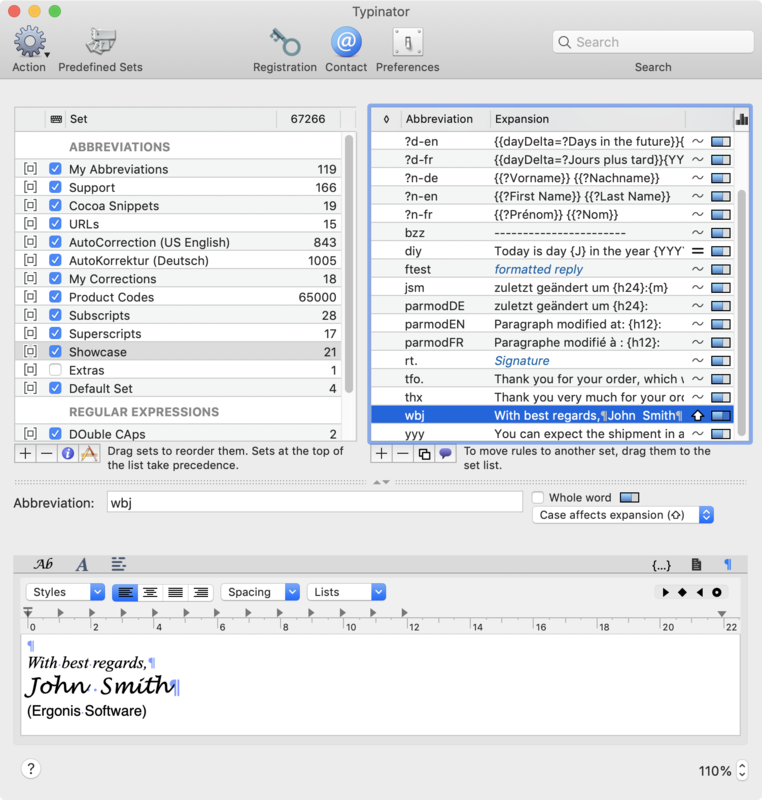 Type the shorthand text into the “Abbreviation” box and the full text below, in the “Expansion” box. Two drop-down menus on the right control formatting of the text and where the cursor will be placed after the phrase is expanded. Once you start filling up the list of abbreviations, you can organize them into folders, called “Sets”. The autocorrection feature supports three languages: English, French and German. ActiveWords uses .NET framework functionality to integrate itself with the Windows operating system. Though it seems like just another text expander, ActiveWords is a way to have complete control over all functions of your computer, without even touching the mouse or typing visible text. You can open a specific folder locally, a web site in your browser or execute an application while holding both your hands on the keyboard. The only minor nuisance is that the ActiveWords trigger key for expanding can only be one of the function keys, F8 by default. 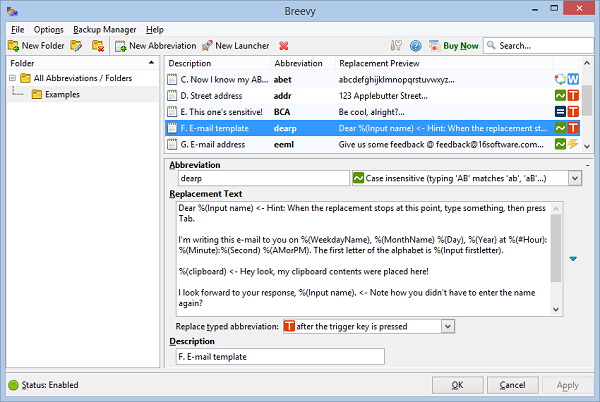 Breevy has three modes of activation: immediately after the word is typed, after a certain character is typed or when a certain key is pressed, the first mode being the default. 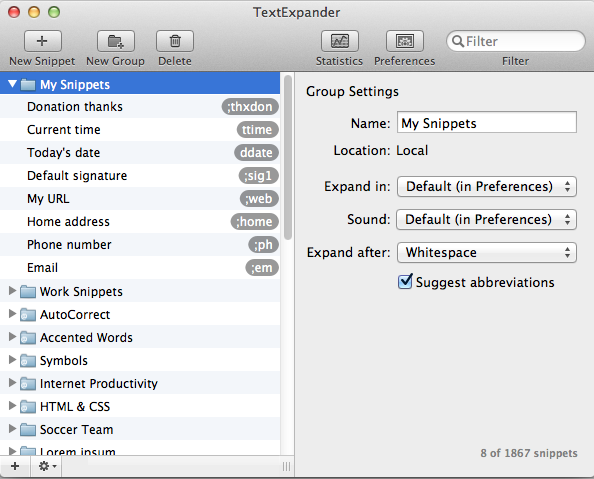 Breevy is also fully compatible with the TextExpander for Mac and can have its phrases synced both ways via Dropbox. This means that you can switch devices without worrying whether your phrases are current. Typing abbreviations with different capitalization will change the expanded text accordingly. Though it touts itself as “Typinator for Windows”, AutoText does not have a comparable range of features Typinator has. There is a nice set of abbreviations for web developers to insert HTML tags, but the tends to get confused if you type very quickly. This results in AutoText sometimes pasting the contents of your clipboard for no apparent reason or opening a new browser window by accident. AutoText is also available for free through a TrialPay offer. Every time you change something in Popchrom, you need to switch to the Text tab and hit “Save”. Popchrom does not have an automatic mode, which means you need to press the hotkey every time you want the text expanded, CTRL+SPACE by default. Also, if you check the option “Select after replace”, the expansion of the text will be undone by pressing the same shortcut again. 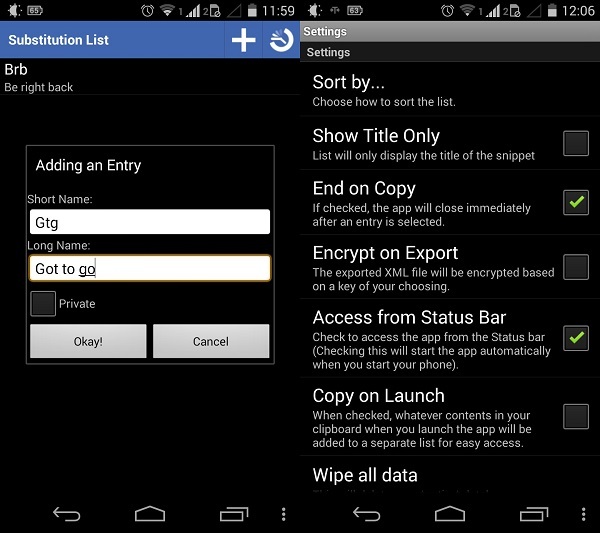 Because Android does not allow any app to access the keyboard, Textspansion isn’t an actual text expander and has quite a limited set of functions it can perform, compared to other programs in this list. It borders on being a mere clipboard manager, with extended cut and paste functionality. The app is launched by holding the search button. If your phone doesn’t have one, the app can be set up to launch from the notification area. The last time this app was updated was on 23rd July 2012. A native text expander has been added to iOS 5, but it hasn’t received any praise. To use it, tap Settings > General > Keyboard and then tap Add new shortcut…. Here you can fill in the “Shortcut” and the phrase you want it expanded to and tap Save. You will have to do this for each phrase separately, but it will save you a lot of time and effort in the long run, which is what text expanders are all about.